"Who's in charge here? I vote for ME." That's how Aquaman makes his introduction to the Justice League in issue three, which in my opinion is a bold way to make your presence known to the world's best superheroes. The band is getting together and we may see a fully united Justice League battling Darkseid and his evil minions in issue four. Wonder Woman and Cyborg also make their first appearance in Justice League #3, which is another action-packed read from the creative team of Geoff Johns, Jim Lee, and Scott Williams. Darkseid has been creating havoc pm Earth and in this issue he has unleashed an army of winged demons that are capturing people and our heroes, sans Cyborg, are battling them furiously. Superman, Batman, The Flash, and Green Lantern are in a fierce battle when Wonder Woman shows up and gives the boys a taste of how they do things in the land of Amazons. Geoff Johns has quite a bit going on in this issue but handles the various story lines very well. The story is well paced and is an absolute page turner. Jim Lee has done it again and I was truly impressed with his work. For example, we have a great splash page with Wonder Woman taking on the demons and there is also a great page where we see Cyborg online for the first time and Lee mixes in a teaser of Darkseid, which is brilliant. 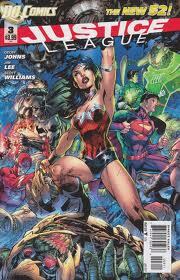 I've been very impressed with the Justice League which has been one of my New 52 favorites. There are no excuses for missing out on this series.